The Film: “This is a One Hundred Stories social gathering. Every time one story ends, one candle is meant to be put out. There is an old saying in which, when the last light is put out, an apparition will make an appearance. At the end of the gathering, it is customary to participate in the curse eliminating ritual.” Thus begins Yokai Monsters: 100 Monsters. The peasants of Edo entertain themselves with such gatherings. They are honest and hard working, though poor. When the greedy Lord Tajimaya orders their shrine demolished to make room for (of all things) a brothel, the villagers are shocked. When they resist, the groundskeeper of the shrine is severely beaten and dies. The residents of the adjoining tenement building then learn that their landlord Jubei is deeply in debt to Tajimaya. The building where they live is also going to be torn down. Lord Tajimaya and his superior, Magistrate Uzen, both stand to profit handsomely from the use of Jubei’s land. To celebrate their impending windfall, they hold their own One Hundred Stories gathering. However, the arrogant nobles refuse to allow the curse eliminating ritual. When Jubei attempts to pay off his debt and save the tenement building, he is murdered and his daughter Okiku is forced into servitude. However, the villagers are no longer alone in their struggle. The masterless samurai Yasutaro enters the fray. What’s more, neglecting the proper ritual has unleashed a curse on the corrupt officials. Even these merciless men will prove helpless against the wrath of one hundred monsters. Extras / Menus: The extras are all trailers. 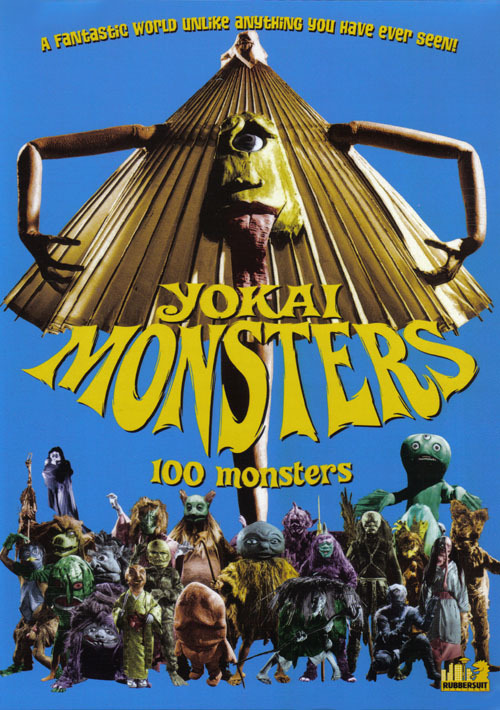 There are both the original Japanese theatrical trailer, and ADV’s U.S. trailer, for Yokai Monsters: 100 Monsters. 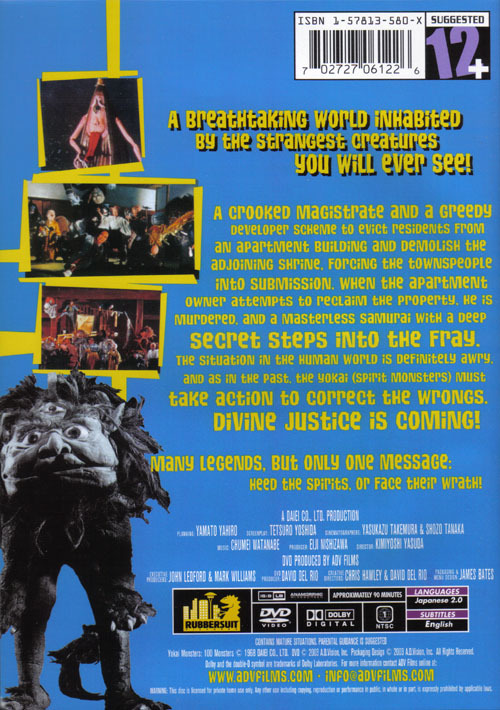 The Japanese trailer is presented in anamorphic widescreen, with optional English subtitles. Quality is good, though there is slightly more print damage than in the feature itself. The ADV trailer is in non-anamorphic widescreen. Grouped separately under “Coming Attractions” are six ADV promo trailers. They are for: Yokai Monsters: Spook Warfare, Yokai Monsters: Along with Ghosts, The Complete Daimajin Trilogy, Gamera 2: Attack of Legion, Gamera 3: Revenge of Iris, and Destroy All Monsters. All are in non-anamorphic widescreen.